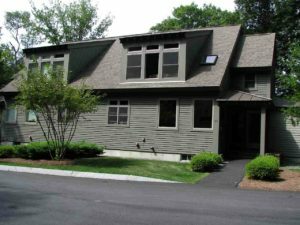 Contemporary Condo For Sale • Vermont and New Hampshire Real Estate - Quechee Associates, Inc. This is your chance to buy a beautiful up to date town home in Quechee, VT and enjoy the four season amenities available there. This condo was built in 2004 and features wood floors, granite counters, cherry cupboards, one floor living, and all within walking distance of the village. It is sold tastefully furnished and is truly a must see home. If you are looking to buy a vacation property or a low maintenance place to live full time, you need look no further. Click the link below for photos and info or call or email for more details and to set up a viewing.